Just behind famous Timberline Lodge, Timberline Ski Resort accesses an awe-inspiring view of Mt. Hood and some of the most exciting snow sports and mountain adventures Oregon’s tallest peak has to offer. Discover the skiing and resort amenities at Timberline. Stay in the historic Timberline Lodge, with handmade furnishings and decorated rooms. Timberline Ski Resort stretches above National Landmark Timberline Lodge to offer exciting snow and mountain adventures year-round. Located 60 miles east of Portland on Timberline Road off Highway 26. Call (503) 272-3158 for ticket information or 1 (800) 547-1406 for Lodge reservations. Anyone who’s seen Stanley Kubrick’s 1981 film The Shining has viewed the beautiful brick facade of Oregon’s Timberline Lodge, which sits in front of the Timberline Ski Resort on the south face of scenic Mt. Hood. Timberline’s ski season is the longest in North America and with its 8,540 top elevation and 500-600 annual inches of snowfall, this resort is one of the most popular ski vacation destinations in the U.S.
Timberline has 1,430 skiable acres, vertical lift of 3,680 feet, 32 trails, terrain parks, and halfpipes. Skiing (both alpine and Nordic), snowboarding, tubing, snowshoeing, snow skating, and night skiing all can be enjoyed at Timberline. Timberline Lodge provides not only lodging in its 70 rustic guest rooms, but a taste of local and native history, souvenir shopping, and fine dining. 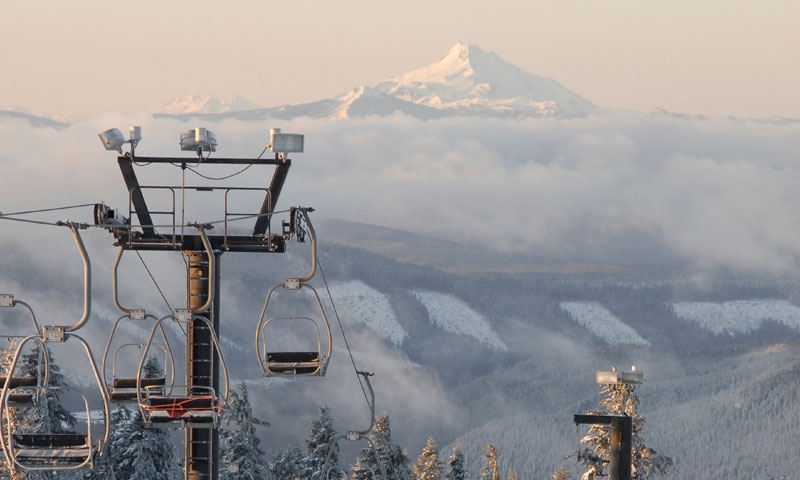 Timberline Ski Resort is located about 60 miles east of Portland; take the Mt. Hood Scenic Highway (US 26-E) east to Timberline Lodge Road. Timberline sits on the south face of Mount Hood at 6,000 feet. Timberline’s lengthy winter season generally runs October 1 – May 31 AND the resort also has a summer ski season which begins in June (summer skiing is limited to the high Palmer Snowfield). Visitors should call ahead to confirm status and weather conditions. 7 ski lifts include the Magic Mile Sky Ride with a fantastic view of Mt. Hood’s summit. Private or group lessons and snow camps with Timberline’s friendly, experienced, professional instructors. Lodging available in Timberline Lodge’s rustic, artisan-furnished guest rooms. Ski, snowboard, and high-performance equipment rentals. Five restaurants and a gift shop.